E3 is a time for most video game fans to get excited and hyped about upcoming releases, and to see all the newest tech that various games companies have to show off. It is sometimes, however, an event of disappointment. Hopefully this year's E3 will be able to surpass the moments in the video above, which highlights the top five moments Nintendo has embarrassed itself and those watching. Pleasingly it wasn't easy finding five of these instances, which shows just how good the big N is at this E3 lark most of the time. What embarrassing instance sticks in your brain the most? Lets us know in the comments below. The most embarrassing moment I can think of was when they showed off Project Giant Robot and then didn't make any games out of its central idea. Switch Music: HD Joy-Con Air Guitar Party! That one hasn't happened yet, just preparing myself for the worst tomorrow. Good lord, Cammy Dunaway, telling us her soccer mom stories. She was so awful. Its funny though because she said she didn't like the smile taken off her face, then Nintendo gave us nothing to smile about for the rest of the show. When she returned in 2009, she didn't get any applause when she was introduced. That Wii Music reveal. My God, like... just... what. Yep, certainly some dark times that I never want to be reminded of. This makes me happy that Nintendo no longer does stage shows. @Vee_Flames I'll admit that as a huge Mario fan myself, the Do the Mario montage was a little too long for its liking, but at the same time, Nintendo has to do something to celebrate the plumber's 30th Anniversary. So, it can't be blamed. So the Wii Vitality Sensor was ditched because it "gave mixed results when it came to actually reading your pulse"? Shame they weren't so stringent with the Wii Remote itself, ha! E3 2008 as a whole was tough to watch. I played Wii Music a couple times and thought it was pretty decent but playing a wind instrument in that game is one of the most embarrassing and awkward things ever. Does not compare at all to playing an actual wind instrument. Maybe not in the top 5, but the Suda51 interview from the Switch reveal earlier this year was a huge mess. Though, I'd eat up a 'No More Heroes' game on the Switch, regarless. The Wii Music reveal may have been terrible but at least it's still good for a laugh. Ah quality of life. I wonder what happened to that. I went off Nintendo and videogames during the Wii years, so I missed all of these embarrassing moments. Good job really, as it probably would have put me off them for life! That presentation with Cammy was the first time I really paid attention to E3. (I've always been into games, but for some reason didn't care about the gaming "news" before then.) Man, was it bad. I had no idea who the "normal" Nintendo faces were and was just annoyed by her obvious lack of gaming knowledge. To be honest, for the longest time I never really liked Reggie either due to Wii Fit presentation. To me, they both just seemed too corporate and obviously were just your typical marketing execs vs people like Iwata who came to his position from within the industry. The Wii Music thing was awful, I almost forgot. "All that glisters"? Am I missing some sneaky reference there? On topic: mr. faux Mohawk swinging his Wii remotes like an epileptic on steroids absolutely takes home the price for most horrible, cringe inducing Nintendo E3 moment, no discussion possible. Nothing else even comes close. Wii Music itself and Cammy Dunaway are a very distant second and third place. @Exy I actually think Project Giant Robo may have developed into ARMS to some extent. Project Giant Robo was basically a tech demo for a motion controlled boxing game that didn't really work using the gamepad to control the body of the robot... swap it out for two separate controllers to control each hand and you'd have something a lot more like ARMS. I'll never forget that awful Wii Music reveal from 2008. Made the Super Mario Galaxy 2 reveal the following year even better though. @DragonEleven Sure, concepts from it were used in other games. But the project as we saw it at E3 never materialized into a full game on its own. And yet none compare to the Konami 2010 conference. These make you groan, that made you want to put them out of their misery. @Haywired seriously? When I hear people complaining about how horrible the Wiimote response was, all I hear is my little kids whining as they frantically wave their arms from the East to the West, pointing at the TV screen for a fraction of a second. A heap of lame/lazy games aside, I had only a couple of instances of frustration during my 6 years with the Wii. Hey Alex, did you know the Wii surpassed the PS2 in hardware sales? I still don't know what was up with Iwata's bananas. I secretly miss the suspense, the highs and the really, really lows. As a fan, I felt pretty crap! But sure, Wii Music deserves the #1 spot and needs to be burned with fire. I didn't have any problem understanding the Wii U was a new system, but I was massively disappointed by the Gamepad being the gimmick for the system. The one thing from the presentation I'll never forget is still hoping for one great final announcement and Reggie sending us off with the embarrassingly lame fireworks for Nintendo Land. Wii times. Well, there are amazing jewels on that plattaform, so, all is forgiven. E3 2008 still gives me nightmares. I haven't been that disappointed in a video game-related event before or since. I will never forget the big announcement at the end of that conference. "What's it gonna be?? A new 2D Metroid? F-Zero? Kid Icarus? New 3D Zelda?" "We present to you..... Wii Music!" @Cheski To this very day, I still credit Nintendo's E3 2008 conference as the reason I bought a PS3. I was so unbelievably disappointed that day, that I ultimately jumped ship and bought my first ever non-Nintendo console. That conference hurt me on a spiritual level. Nintendo has since won back my trust and loyalty (mostly), but that was a dark day. First time in my life that I was embarrassed to be a Nintendo fan. Thank god shiggy doesn't make those mii games anymore! The Switch reveal but pretty embarrassing, it was cringe worth for 95% of the time. My wife looked at me in disgust while I was watching it and walked out of the room. Watching this in preparation for the Ubisoft conference. Ugh. Good. Lord. I seriously can't watch that Wii Music demonstration. My body won't let me. It just keeps automatically putting my hand over my eyes. @ThanosReXXX - it's a Shakespeare quote. And also one of my pet hates when it's misquoted to "all that glistens isn't gold". So respect to @Alex_Olney for the glisters! My blood pressure says thank you. I love that you made this video. Can we get a top 5 best as well? I realize the Wii had a lot of great games. Metroid Prime Trilogy, Mario Galaxy, Twilight Princess and Skyward Sword (well I liked Skyward Sword), DKC Returns...But seeing this makes me so glad we're past the Wii and Wii U. There were so many awkward gimmicks involved, and some of the late years of the Wii's life felt so barren. Seeing that Wii Music reveal just reminded me of how lame Nintendo could be at this point in their history. The success of the Wii obviously went to their heads. I'm honestly glad the Wii U struggled since it helped bring Nintendo back in to reality somewhat. Also, I'm surprised E3 2003 didn't make it onto this list. Wasn't the biggest game they revealed pretty much just Pacman VS. or something like that? @ThanosReXXX - off topic but did you get to try ARMS during the test punch? It says that "glisters" is ye olde English for "glitters", so the latter is the way it should be pronounced today. As for ARMS: unfortunately, no. I don't have a Switch yet, and there also weren't any of those events anywhere near my vicinity, so I never got the chance to try it out. Current funds and priorities also don't predict a Switch in my possession anywhere in the near future, so that's probably going to be somewhere next year, or perhaps even later. Hey! Alex got a haircut! @ThanosReXXX - La la la, not listening to Wikipedia - allow me to be a grumpy old man over this! Well, if you're ever in England and in the area I'm sure we could have a little game session and set the world to rights. @Mii_duck P.S. You're old? I wonder what that means for me, since I do believe I'm ever so "slightly" older than you. It's a shame this wasn't at E3. I reckon it could've placed. Here I thought the Federation Fighters trailer would appear. Was not aware of these embarrassing moments, but like.. Wii Music was embarrassing, but looked awesome at the same time. 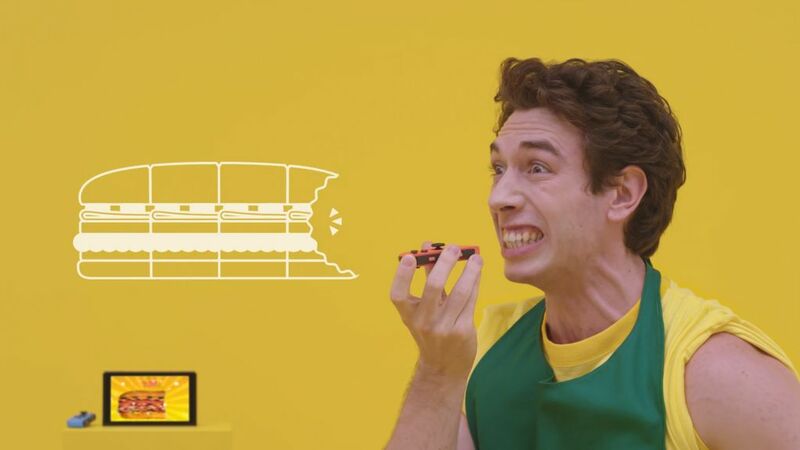 I'm so glad Nintendo didn't end last E3 with a similarly disastrous, bloated showcase of 1-2 Switch. I honestly think that would have been a death knell for the console. Part of the disappointment comes from our high expectations, which I suppose is a good thing. Frankly, I'm kind of glad there's not so much E3 pressure these days. I like the reveals more spread out and the company speaking more directly to its audience.